A signature Spanish-style bocadillo at Tejas Market & Deli. 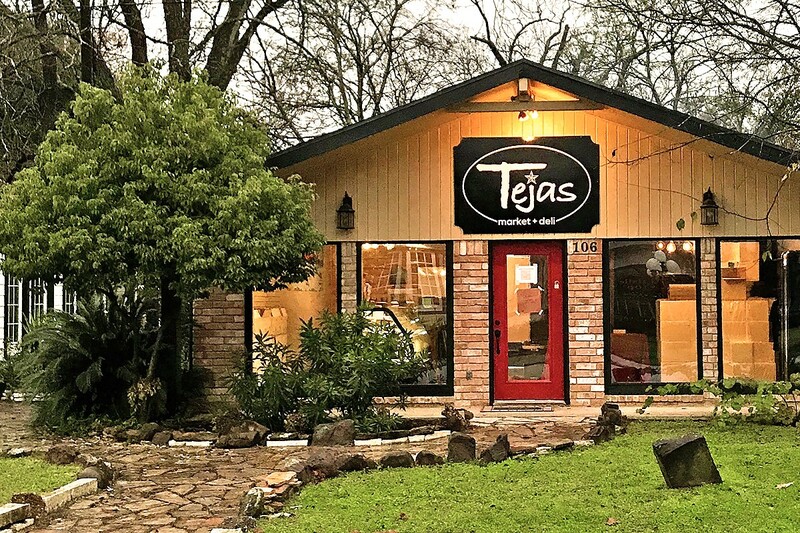 Tejas Chocolate Craftory & Barbecue at 200 North Elm in Tomball is regarded as one of the top barbecue restaurants, not just near Houston but in all of Texas. Now, for the first time, it’s expanded. With almost no fanfare, owner Scott Moore Jr., partner Michelle Holland and chef Greg Moore (Scott’s brother) quietly opened Tejas Market & Deli on January 4. It’s located next door to the original Tejas in the same quaint shopping village. The space used to be a children’s clothing store. There, they’re using the smoked meats from Tejas to create intriguing Spanish sandwiches prepared on baguette-style bread called bocadillos. In Spain, bocadillos are a popular casual meal, just like a submarine sandwich is in the United States. 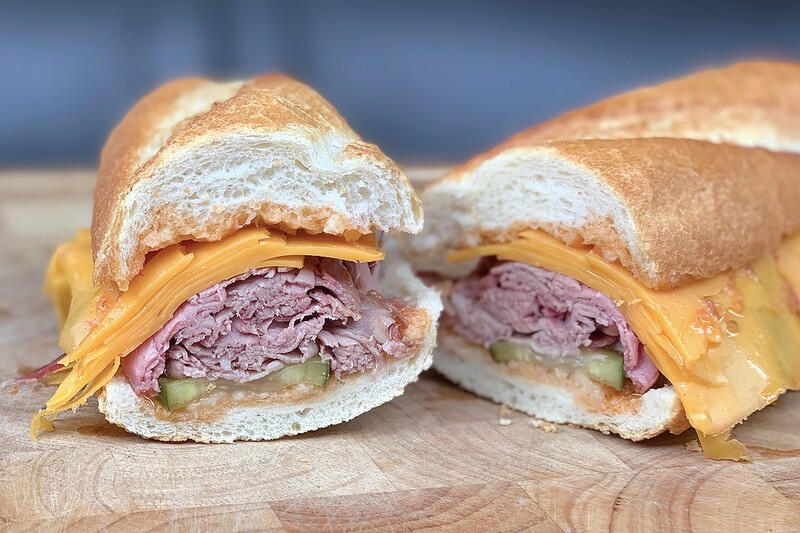 Unlike American-style sandwiches, though, bocadillos emphasize high-quality breads, meats and cheeses without interference like lettuce, onions or creamy condiments. “A common bocadillo in Spain is Serrano ham, Manchego cheese, piquillo peppers and olive oil. We’ve got a take on that with house-cured ham and Manchego cheese. We made an olive and piquillo pepper tapenade dressing to go with that as well as a smoked tomato vinaigrette.” Moore says that other varieties include 44 Farms roast beef, shaved prime rib from Ruffino Meats in Bryan and Tejas smoked turkey. The regular eight-inch bocadillos cost $10 and premium offerings, such as the prime rib, are $13. Tejas Market & Deli in Tomball. Photo courtesy of Scott Moore Jr.
It’s a natural progression as meaty sandwiches are often barbecue joint menu staples. 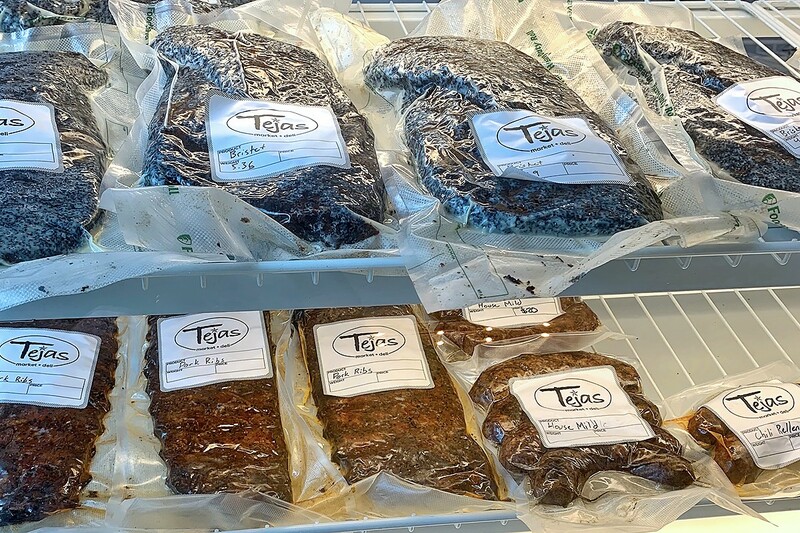 In addition, Tejas Deli serves as a place where patrons can buy the same smoked meats served at the barbecue restaurant, but either on sandwiches or chilled, vacuum-sealed and ready to take home to reheat. Smoked meats ready to take home, heat and eat at Tejas Market & Deli in Tomball. Photo courtesy of Scott Moore Jr.
An additional menu item is totally new for Tejas. Scott’s partner Michelle Holland now bakes what he’s calling “brunch pies” with either sweet or savory fillings. While they could be called “quiche,” Moore says men still tend to shy away from it and “brunch pies” is a better term for these hearty offerings. “It’s like a manly quiche,” he said. “They’re big and real men do eat quiche.” The savory fillings include brisket-and-mushroom, Quiche Lorraine with pork belly and Tejas chile relleno sausage. A whole pie is $35 and a slice is $6. Customers can also find a few varieties of Tejas Chocolate Craftory’s truffles (the chocolates, made from scratch starting with the cacao beans, are actually how the Moores got their start) as well as pick up soup to go. Tejas Market and Deli only sells it chilled for now but the owners plan on adding a daily hot soup special in the future. In the greater Houston area, it’s the residents of Tomball and northwest Houston who are the lucky ones with not just one but two good reasons to visit the historic little shopping district on Elm Street.